Gabrielle's Angel Foundation for Cancer Research raised $3.6 million and counting for blood cancer research at its annual fundraiser, the Angel Ball, Monday night at Cipriani Wall Street. This black-tie benefit, hosted by Grammy-nominated songwriter Denise Rich and her daughters Daniella Rich and Ilona Rich Schachter, honored the work of Heidi Klum; Amy and Brian France, Chairman and CEO of NASCAR, Founders, The Luke and Meadow Foundation; Mary Kitchen and Jon Orszag, Co-Founder of Compass Lexecon, Co-Directors of The Orszag Foundation. Pop rock sensation OneRepublic, legendary vocalist Patti LaBelle and Tony and Grammy Award-winner Billy Porter performed throughout the evening. The Angel Ball honors individuals who have made significant humanitarian and philanthropic contributions in support of cancer research and boasts attendees in the fields of business, philanthropy, and society alike for this annual celebration of life, music and the quest for a cure. The evening was emceed by Alicia Quarles, Entertainment Correspondent seen on E!, Entertainment Tonight, The Today Show & MSNBC. Nick Cannon presented the “Angel of Light” honor to his friend and “America’s Got Talent” co-host Heidi Klum, where he made note that Klum is a woman who is “beautiful inside and out.” In her acceptance speech, Klum dedicated her honor to those fighting to beat cancer. “This one’s for you. I’m just going to keep it at my house because it’s so pretty,” Klum said with a smile. Throughout the evening, Jeff Gordon presented the “Angels of Hope” honor to Amy and Brian France, and James Carville presented the “Angels of Inspiration” honor to Kitchen and Orszag. Simon de Pury orchestrated the live auction. Highlights included a 2016 Porsche Cayman GT4 that was on display outside the event, which sold for $125,000; a stunning pair of Lorraine Schwartz black and rose gold sapphire earrings, modeled by musician and actress Kat Graham, that sold for $70,000; and a 6-day Caribbean cruise on a luxury yacht that sold for $140,000. As dessert was served, LaBelle took to the stage singing “You Saved My Life.” The crowd leapt to their feet and hit the dance floor after the opening to “Lady Marmalade” began to play. LaBelle invited gentlemen from the audience to join her on-stage, including the evening’s opening performer Billy Porter, who harmonized with LaBelle as the crowd sang along. The Angel Ball stands out as one of the highlights of the New York social season and features a cocktail reception, dinner, surprise musical guests along with a luxury live auction and online auction hosted by Charitybuzz.com. This online auction continues through November 4th. To bid, visit: charitybuzz.com/angelball. 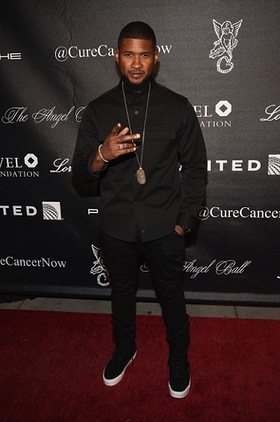 Additional guests included Usher & Grace Miguel, Angel Ambassador Selenis Leyva, Alina Baikova, Kat Graham, Star Jones, DJ Cassidy, Patina Miller, Andreja Pejic, Sam Moore, Kelly Rutherford, Ivana Trump, Montel Williams, Shanina Shaik, Devon Windsor, Toni Garrn, Deborah Cox, Rachel Hilbert, Sharina Gutierrez and Tamara Mellon. Board Member and celebrity jeweler Lorraine Schwartz served as this year’s Gala Chair, as well as a sponsor. Other sponsors included Jynwel Charitable Foundation Limited, Porsche Cars North America, Perrier Jouët and United Airlines.